Radiance, a semi-automated chemiluminescence (CLIA) plate analyzer is designed to offer total independence in immunoassay testing and fulfills all the requirements of a small and mid-sized clinical laboratory. With Radiance, it is now possible for any start-up laboratory to initiate routine and esoteric immunoassay testing with high end enhanced pulse CLIA technology. Radiance provides accurate and fast reports which helps in gaining clinician’s confidence. The combination of best in the class Photomultiplier Tube (PMT) and rugged distinctive design delivers high end performance. 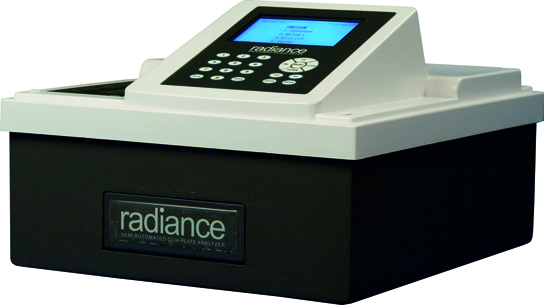 A host of superior features makes Radiance an apt microplate analyzer for Indian clinical laboratories. Radiance comes with a precisely crafted optics to capture optimum chemiluminescence and is equipped with highest quality of hardware to compliment the Indian clinical laboratory conditions. Radiance is compatible with AccuLite reagent platform which facilitates the user to perform more than 30 analytes from a single kit. The Radiance - AccuLite combination is designed to reduce the technology gap, cost gap and performance gap. Radiance instills true democracy in immunoassays by equipping the local laboratory to generate patient test results at par with large referral laboratories. Radiance is capable of handling 5 to 50 tests/day.